CALGARY, Canada - The First Alliance Church in Calgary is home to a 75-year-old sanctuary that seats 1,700 people. 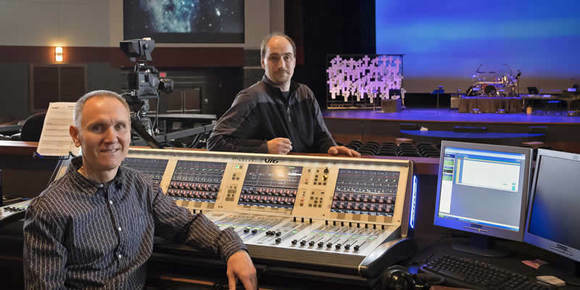 The size of its congregation, combined with the various styles of music and dynamic worship services, prompted Technical Director of Environments Paul Nadeau-Bonilla to recently upgrade the Church's audio system with HARMAN's Soundcraft Vi6 digital console, installed by Sapphire Sound in Vancouver, B.C. The Church hosts full orchestras, choirs and bands, on top of its annual Broadway-style Christmas musical. The Vi6 was chosen for its ability to accommodate and switch seamlessly between all types of productions with minimal setup times and clutter. With 96 inputs to 35 output channels, the Vi6 is capable of handling any large-sized venue with ease. "Before buying the Vi6, we researched flagship models from many other brands," said Nadeau-Bonilla. "From an ergonomic standpoint, the Vi6 is head and shoulders above all the other consoles. The intuitive layout and visual appearance drastically improves our workflow, and the onboard features are really easy to work with, unlike some of the confusing navigation on other digital consoles." The Soundcraft Vi6 pushes boundaries by empowering the user with features that improve ease of use, rather than the culmination of controls that get lost in endless menus. The beautiful 'knobs-on-glass' controls sit on top of the Vistonics™II channel strip interface, providing users with the most unadulterated monitoring and mixing experience. The Soundcraft FaderGlow™ color-coded illumination for the faders is particularly eye-catching, and gives the user an additional level of status indication, significantly reducing operating errors. "The details in the layout of the Vi6 are amazing," according to Wayne Jeschke, Associate of Technical Arts. "Someone can run wireless microphones and orchestra at the same time, while the Cue Advance buttons and Snapshots are readily available and well within reach. We wanted something as user-friendly and analog-like as possible, and I believe the Vi6 hits the sweet spot. Even some of our non-technical engineers are able to work on it flawlessly." "We did not expect the sound to be this good," Jeschke continued. "The difference in clarity from our older board is so great, that we get compliments from numerous untrained people all the time. The user-friendliness combined with a clean, natural sound makes the Vi6 an extraordinary console within its class. It blew us away." Photo Caption: (Left) Wayne Jeschke, Technical Associate, First Alliance Church; and (Right) Paul Nadeau-Bonilla, Technical Director of Environments, First Alliance Church.